I discovered a recipe for artisan bread through a Dunnes Stores newsletter that worked a treat and so began my bread-making phase…so while the artisan bread was super easy to make and tasted great, I wanted a bread I could eat in like an hour…so I searched YouTube for a recipe for soda bread and stumbled across this video by Paul Hollywood & BBCFood. The video is great. 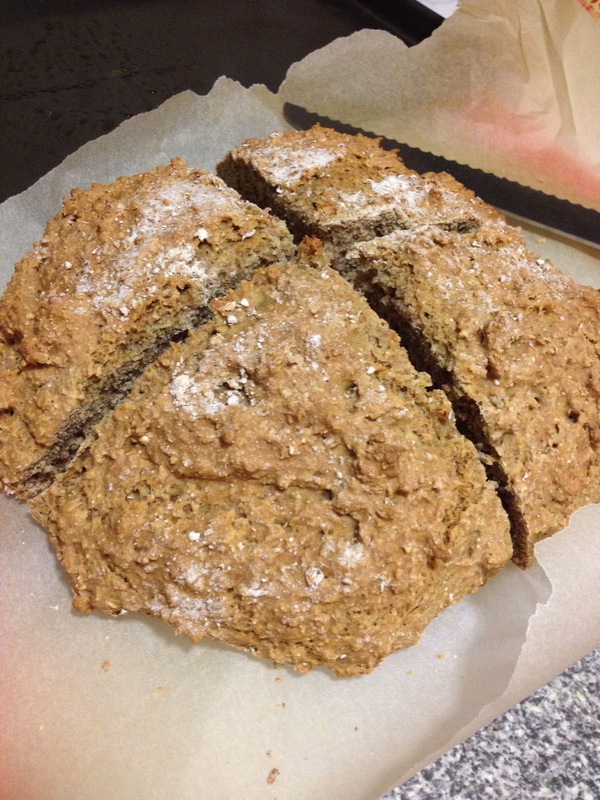 It’s short and simple and makes soda bread making look so easy! Turns out making irish soda bread is easy peasy et voilá! Here’s the finished product! 2. In a large bowl, gently mix the dry ingredients. 3. Add the buttermilk and mix until a very sticky dough forms. 4. Dust the working surface with some flour and gently bring the dough together until it resembles a rounded ball-like shape. Tuck the edges gently under the dough in a rounded motion…(see the video for a proper description!). Don’t knead the dough as the texture will be chewy rather than crumbly. 5. Place the dough on a baking sheet/tray lined with grease-proof paper and cut a cross into the bread to “let the fairies out”…while Paul says “let the devil out” I was always told it’s to let out the fairies…! 6. Bake at 200°C for 30 minutes on the middle shelf. And that’s it! Super simple and easy to make! I didn’t have any buttermilk so I substituted regular milk with a teaspoon of white wine vinegar added. You could use lemon juice instead of vinegar, anything acidic does the job I think. Some people use a tablespoon of acid but I was pretty happy with the way the bread came out so I’m gonna stick with 1 teaspoon. I also used bread wholemeal flour rather than plain wholemeal flour since I already had the wholemeal bread flour.